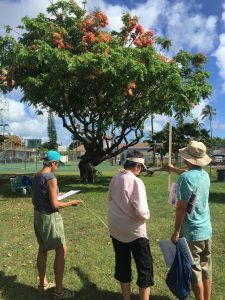 An urban tree inventory was identified as one of the top strategies in the Urban Forestry Section of Hawaii’s Forest Action Plan. There is no formal inventory of trees currently being used in Hawai‘i, which can hinder efforts to manage, maintain, replace trees, and plan for disasters in the urban forest. Another key strategy in Hawaii’s Forest Action Plan (FAP) is improving the public perception of the value and benefits of urban trees. The Citizen Forester program looks to address these strategies by engaging communities in their urban forests through the use of citizen science to develop an urban tree inventory. The Citizen Forester program trains and supports community volunteers to collect urban tree inventory data. Certified Arborists support the volunteers and ensure quality control of the data. Volunteers work in small teams with a trained Team Leader to collect data. Meet-ups take place weekly or more often depending on interest and availability. The program was piloted in 2016 in the town of Kailua on Oahu and is now expanding to new communities. Volunteers have inventoried and mapped over 5,600 trees in Kailua since June 2016 and over 1,100 trees in Honolulu since October 2017. Volunteers continue to collect data on a weekly basis as the project includes a systematic inventory of City trees in urban areas, such as along commercial and residential streets and in parks. We all look forward to spending time with you in Oahu’s urban forest! Missed our recent training sessions? It’s not too late! You can enroll at any time and we will mentor you. Please fill out enrollment form. Missed our recent training sessions? It’s not too late! You can enroll at any time and we will mentor you. Sign up below.